The Hamilton Tiger-Cats have agreed to terms with veteran running back John White, according to a report from Justin Dunk of 3DownNation.com. 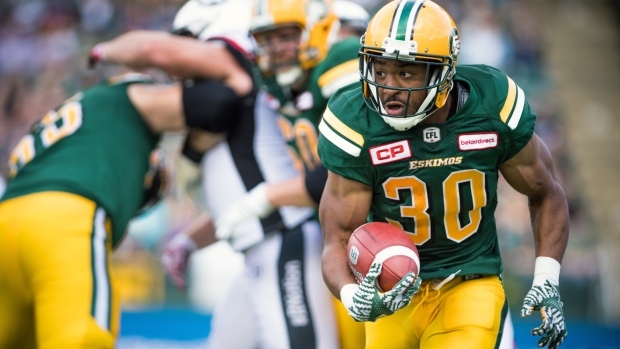 White was released by the Eskimos last month after five years with the team. The 26-year-old missed all of 2015 after a torn Achilles and all but two games last year with a torn ACL. When healthy, White has been very productive. He rushed for 886 yards and eight touchdowns on 164 carries in his last healthy season - 2016 - and has 376 carries for 2,110 yards, and 12 touchdowns in 41 career CFL games. The Ticats are expected to start Alex Green at running back this season after the 29-year-old rushed for 447 yards and five touchdown on 79 carries replacing the traded CJ Gable last year, but the sophomore missed practice Tuesday, according to 3DownNation.com.